Image courtesy of Disney Studios. Doing follow-ups to films made almost 30 years ago is always a challenge, so when I first saw the trailers for Tron: Legacy, I was a little nervous. This was a film that I grew up with as a child since every time I turned on the Disney channel it was either Tron, The Neverending Story, Honey I Shrunk the Kids, or The Flight of the Navigator playing. I had not seen the original in perhaps 12 years, and I made it a point to not see it again before seeing Legacy because I did not want this review to be a comparison piece - I wanted to view this in its own right. And wow, was it a whole lot of fun. First off, this is one film where it is definitely worth shelling out the extra cash to see in 3D. It fits the Tron universe so perfectly it's a shame the technology wasn't around for the first. From the motorcycle races on the nefarious "Grid", set in a new-age Colosseum-type atmosphere, to the high-speed jet chase, the film takes every possible opportunity to swing it's way out at you and make you part of the cyberscape. The first 15 minutes of the film are not the best. The opening is left with much to be desired, however Garrett Headlund, who plays Flynn's son Sam (Flynn is the creator of the world Tron, played by the inemitable and timeless Jeff Bridges) strikes the right chord between being the cocksure hero and the relatable decidedly human trait of not really knowing what the hell is going on. Too often in action/scifi adventures, the hero character can become really bland and is only colored by the characters he interacts with (I'm looking at you, Luke Skywalker.) But Sam is really likeable. He's not the prodigy like his Dad, but he's got enough street smarts to be the only one who can take care of business. Perhaps I can relate more because Sam is probably supposed to be my age - a kid that understands the 80s from a child's perspective, when videogames were the new kid on the block and Journey ruled the airwaves. Once in the world of Tron, the film starts getting its sea legs. There is a moment when Sam first enters his father's old store right before getting sucked in that literally sent a rush of anticipation down my spine. It was at that moment I knew the film really had me locked into its world. 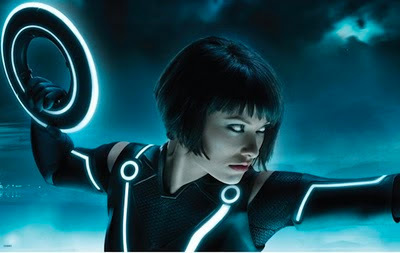 That is the biggest success of the film - immersing you into the world of Tron. It's a pale, sleek, stark landscape that suggests a cleaned-up Matrix - indeed, some of the action sequences purposefully give a nod to it. And the cerebral, synth-cyber music of Daft Punk is the perfect accompaniment that finds its way into your blood stream. It would be so easy for the actors to cave in and give performances as cold and shallow as the filaments of light on their body suits but instead, everyone - down to the all-too-brief performance of Michael Sheen as the urbane Zuse- takes their roles to their maximum potential. There are flaws of course - those not having seen the first Tron might get a little confused as to the relationships between the "users" and the "programs", and the digitized younger Jeff Bridges still looks a little...off. It is scary to see how close they are getting with merging the digital with the real in films. Also, there could have been more development on how the world of Tron has evolved since the rise of a little thing called the Internet. But I always evaluate my movie experience by how I feel at the end of it, whether it be indifferent or angry that a film did not achieve its full potential. Tron Legacy left me feeling like I just got off Space Mountain-exhilarated and addled, my heartbeat pumping to the electonica bass and my inner 80s child grinning from ear to ear. I also highly recommend downloading the Tron: Legacy soundtrack. Daft Punk pays the film the ultimate tribute by incorporating the latest in electronica while maintaining the very 80s-esque tunes. Now, where can I get one of those cool light-striped suits?? !